Dirk Nowitzki confirmed Tuesday what much of the NBA had anticipated most of the season, announcing his retirement in an emotional, star-packed ceremony during the Dallas Mavericks’ home finale win over the Phoenix Suns. But there was still more basketball to be played after Tuesday. And there were more tributes and tears from Dirk. Wednesday afternoon, former Presidents Bill Clinton and Barack Obama congratulated the 21-year NBA veteran. And congratulations Dirk Nowitzki. You deserve our sincere thanks for being an incredible international ambassador of the game and a world-class human being. Can’t wait to see your next chapter too. The Mavericks finished their season on the road Wednesday night against the San Antonio Spurs. 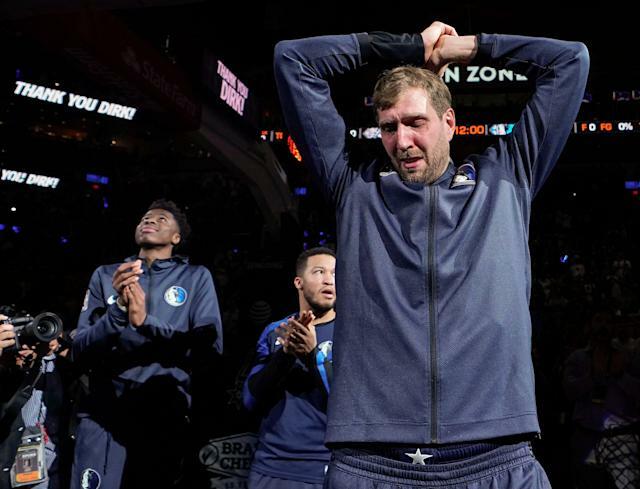 And Nowitzki’s longtime Texas rivals moved him to tears with a video tribute that came before his final introduction in an NBA game. It’s not the first time the Spurs honored a rival this season. Head coach Gregg Popovich presented Miami Heat guard Dwyane Wade with a gift of autographed jerseys from Spurs icons Tim Duncan, Manu Ginobili and Tony Parker during his much-celebrated retirement tour. Unlike Wade, Nowitizki kept his retirement plans under wraps until the Mavericks home finale. But with one last road game, the Spurs took the opportunity to send Nowitzki out with a tribute from a rival. Nowitzki closed his career with a 20-point, 10-rebound performance in a 105-94 loss to the Spurs. He also had one last opportunity to show off his trademark step-back jumper in the game’s final seconds. That bucket was a perfect note to close on as Nowitzki checked out one last time to a standing ovation from an appreciative San Antonio crowd.